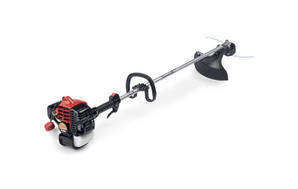 Snapshot: The Shindaiwa Home Pro 22T petrol line trimmer has 2 cutting lines and weighs 5kg. But how effective and easy to use is it? "Excellent line trimmer, really light and easy to load nylon"
28 Dec 2015, Andrew W.
The lightweight factor is really good, very easy to start, the SpeedFeed nylon head is miles ahead of my old one. You don't have to take the cutting head to bits to load the nylon, so you can't lose the spring in the lawn (like I did with my old one) and you can't stuff up loading the nylon. Just what I was looking for. I hadn't heard of the brand before, but the 5 year warranty gave me a good idea about the "Made in Japan" quality. Turns out that all the lawn mowing guys I have seen in my area (Wellington) are using Shindaiwa line trimmers, so I guess I should get years of life out of it. Can't think of any. Could have come with a harness, but it's pretty lightweight and I don't really need one.